Blessed Bag – At Blessed Bag our mission is to bring hope and show God’s love to those going through the cancer journey and undergoing cancer treatments. Blessed Bag’s mission is to show God’s love to those going through the cancer journey and undergoing chemotherapy treatments. We accomplish this by giving patients a Blessed Bag; a high quality bag filled with comfort items to combat the side effects that chemotherapy often bring. We lovingly refer to our Blessed Bag recipients as “Warriors” because they are facing a battle that they cannot see. We want to empower them to fight, be brave, have faith, and win the battle! There are countless warriors battling cancer that need to be shown that they are loved and cared for when going through one of the toughest journeys in life. 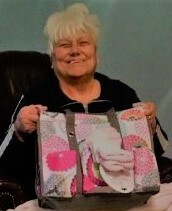 Please help Blessed Bag to make a difference in someone’s life by giving our gift of love and hope! Help Blessed Bag with our mission – donate today!